Choosing the right office art is important and Rippingham Art can help. Original contemporary art can enhance any interior, and can be particularly useful in creating a good atmosphere at work. We spend much of our time in the workplace, and a welcoming and stimulating interior can lift moods, encourage motivation, and provide a welcoming environment for people visiting your place of work. We choose artwork for our homes based on our personal taste, but workplace art can be more difficult as one is trying to cater to the taste of every person who may pass through. Choosing art to please everyone is a challenge but still achievable. 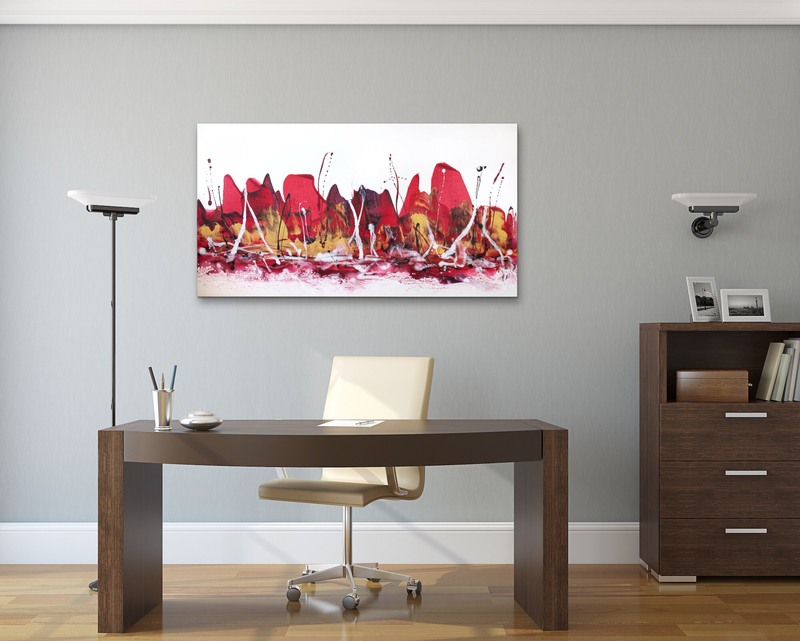 When choosing office art, many larger corporate workplaces tend to lean towards abstract artworks, as its non-representational nature can be seen as neutral. If the right piece is chosen it does not offend, and needn’t be too distracting either. The style of work chosen will naturally reflect each company. Still life or floral art may be welcome in environments such as a café or hotel but would perhaps be less suitable in a marble corporate reception area. It can also be a good idea to give consistency to the pieces, by purchasing works of a similar colour or theme or works by a particular artist. Rippingham Art can help with the decision. We are happy to advise on which artworks would be suited to a particular environment, and have many pieces which are on a large scale, making a good focal point or statement piece for a large room or lobby. Most of our artists are happy to undertake commissions and would therefore be able to create a piece specifically for your chosen space to whatever size and colours you require. We are also different in that we can offer not just original paintings, but also sculpture, glass pieces, photography, and prints. Original sculpture can be fantastic office art for an entrance or lobby. We have many large scale pieces which would add character and beauty to any environment, creating a talking point if you should so wish, or simply enhancing your existing interior décor. This is also true with glass art. We have larger, more dramatic works, or smaller pieces which can add a finishing touch and compliment your other chosen artwork. We can be contacted with any questions regarding office art through our contact page.